A serious zero-day vulnerability has been discovered in ImageMagick, a widely popular software tool used by a large number of websites to process user’s photos, which could allow hackers to execute malicious code remotely on servers. Slack security engineer Ryan Huber disclosed a zero-day flaw (CVE-2016–3714) in the ImageMagick image processing library that allows a hacker to execute malicious code on a Web server by uploading maliciously-crafted image.For example, by uploading a booby-trapped selfie to a web service that uses ImageMagick, an attacker can execute malicious code on the website’s server and steal critical information, snoop on user’s accounts and much more. In other words, only those websites are vulnerable that make use of ImageMagick and allow their users to upload images. 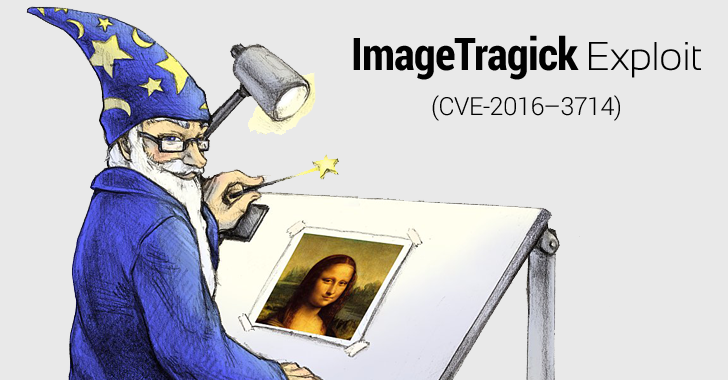 The exploit for the vulnerability has been released and named: ImageTragick. Though the team has not rolled out any security patches, it recommended that website administrators should add several lines of code to configuration files in order to block attacks, at least via the possible exploits.Web administrators are also recommended to check the ‘magic bytes‘ in files sent to ImageMagick before allowing the image files to be processed on their end. Magic bytes are the first few bytes of a file used to identify the image type, such as GIF, JPEG, PNG. The vulnerability will be patched in versions 7.0.1-1 and 6.9.3-10 of ImageMagick, which are due to be released by the weekend. Now that ImageMagick version 7 is released, we continue to maintain the legacy release of ImageMagick, version 6, at https://legacy.imagemagick.org.